Filofax Has Been Quiet… Bit The Courteeners Have Not! My apologies once again for leaving you out in the cold. It’s just… things are really busy with work and I’ pretty much a zombie when I get home from the Fastener World at night (nope, that’s not where I work, I work in the fastener trade, I just think it sounds nicer calling it the Fastener World – sounds like a bit of a community, right? I mean, I guess it is, especially in the Midlands where I live… a very um, incestuous trade – everyone knows everyone and moves around in the same circles etc…) but anyway, you’re not here to listen to my silly excuses! 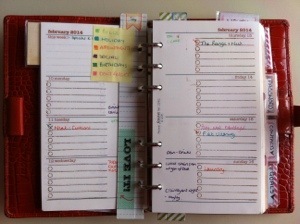 So, what’s been happening in my organised life? It’s slightly too organised – not much is happening apart from me working and spending far too much in the shops on my home. On the plus side my home is looking more pulled together and homely courtesy of Next Home, but as I’ve been getting into bed (it’s too cold!) and getting straight on youtube to zone our for a few hours with a few tunes, it’s left zero time for me to actually DO anything. You may have noticed however, I have been using the notes section of Studio L2E’s planner stamps. I purchased mine in December but they didn’t have any in stock until mid Jan. I couldn’t wait to get them as I felt lost without my daily to do tasks separate from my events. I’ve felt my style changing again. I’m going back to my old Madchester roots, falling in love with the likes of the Stone Roses, Charlatans, Inspiral Carpets, Chameleons, Verve etc all over again, thanks to the band that got me to purchase my first physical CD in about 10 years. I’ve been a Courteeners fan since probably 08, and in December I saw the music video of their latest Single, “Are You In Love With A Notion?” Taken from their 3rd record, Anna which made me finally go out and purchase the entire album. And I don’t buy albums… Ever. I fell in love immediately with the video (although I loved Liam Fray’s old “northern” haircut more) and oddly felt a bit of a 60’s/Mod love bubble to the surface. Out came the old videos: Across The Universe, Bronco Bullfrog, Alfie, Pirate Radio and the cult classic, Quadrophenia. I purchased a gorgeous vintage 60’s dress, I rocked the fringe and cat eye make up a-la Briggitte Bardot, immersing myself in the nostalgic spirit of the psychedelic sixties. And then I got to thinking: are there other 60’s and 70’s style lovers out there?